Active Citizenship Network strongly believe that vaccination is a right and an extraordinary tool of public health, which must be known, valued, spread and used in the interests of individuals and the community. However, it is necessary to work and contribute to a proper vaccine culture. In addition, it is necessary to ensure rigor and transparency, in order to recover confidence in science. For this reasons, after the successful event “The challenges of life-course vaccination to enhance public health protection in Europe: a multi-stakeholder approach", ACN has organized a public event to reflect, in a multi-stakeholder environment, on the commitment of EU Institutions to the topic and to produce a proposal of positioning to strengthen the cooperation among all relevant actors. It would contribute to a more integrated policies cooperation to the theme, avoiding any silos approach. 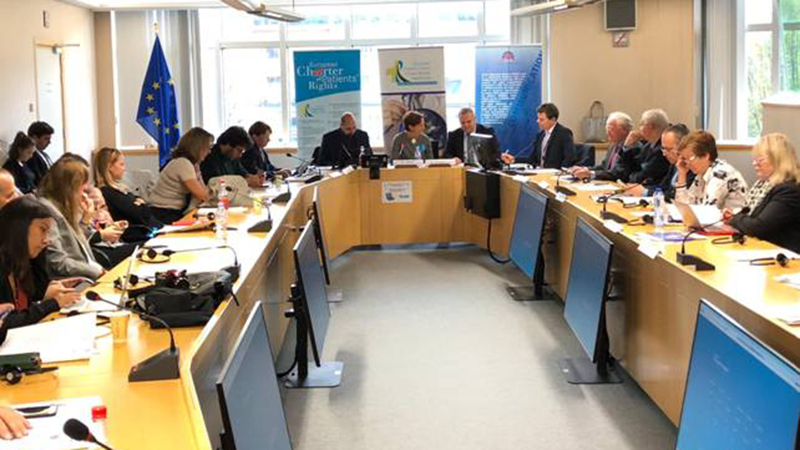 It has been hosted by the MEP David Borrelli in the framework of the MEPs Interest Group “European Patients’ Rights & Cross-Border Healthcare”. Vaccines are the most effective way to prevent the most serious infectious diseases. It’s very important to promote vaccine plans for their incontestable impact on the whole world and for the health opportunities they give. Public health workers, and in particular the operators of vaccination services, are engaged in a real professional challenge, determined by an increasingly widespread vaccine hesitation. Prevention activities, which until a few years ago were reflected in excellent vaccination coverage, today risk being thwarted by the halo of negativity that has surrounded the vaccines for some years, precious prevention tools that soon became the object of criticism, debate, disinformation, doubts and insecurities of parents. Leaders and activists engaged in social, civic and patients associations, parents, teachers, health workers, bloggers and popularisers: everyone can commit to disseminate correct scientific information, ready to defend the use of vaccinations from the wave of misinformation that is being spreading for some years. The institutions, starting from the European ones, have long been engaged on this front. In particular, as the European Commissioner for Health Andriutakis recently mentioned1: “The Commission can play a key role on scientific research. To this end we work closely with the European Centre for Disease Prevention and Control. Mandatory vaccination has indeed increased vaccinations uptake. More data is needed to understand if and how changes in vaccination policies influence trends. We work with a broad range of stakeholders and we want to launch a new joint action with the member states to come to a shared vision to improve vaccination coverage. This will be co-financed by the health programme. Focus will be on the following points: convergence of vaccination schedules, effectiveness of vaccination policies, promote cross-border interoperability, increase confidence in vaccines, reduce mistrust, enhance effectiveness, improve electronic vaccination registries, enhance public engagement, foster understanding of importance of vaccination as key tool for preventing diseases. The time has come to engage with MS with a view to increasing acceptance and uptake of vaccines in EU. There is common ground to counter vaccine hesitancy, and evidence, transparency and sustainability of national vaccination programmes need to be strengthened to increase effectiveness of vaccination R&D. There is broad agreement about the added value of EU level cooperation on vaccines. Limited resources must be maximised together, and it is crucial to work towards more convergence national vaccination policies”. Cittadinanzattiva and its EU branch Active Citizenship Network strongly believe that vaccination is a right and an extraordinary tool of public health, which must be known, valued, spread and used in the interests of individuals and the community. However, it is necessary to work and contribute to a proper vaccine culture. In addition, it is necessary to ensure rigor and transparency, in order to recover confidence in science. At national level (Italy), for years Cittadinanzattiva has provided assistance to people harmed by vaccinations (not vaccines). It is crucial to ensure the correct pre-vaccination history, informed consent, vaccine supervision and transparency for all stakeholders, including citizens, with periodic reports and adequate support for parents who report potential adverse effects. At European level, Cittadinanzattiva has been involved in the Technical Advisory Group of the ECDC (European Centre for Disease Prevention and Control) intensifying its activity at EU level on the topic. About it, Active Citizenship Network welcomes the European Commission initiative to launch the EU Joint Action for Vaccination (JA-03-2017), a great opportunity for further harmonization of these policies across Europe, to address common challenges faced by the EU Member States, to increase the cooperation with all the stakeholder, civic and patients organizations included.